When we see children playing in a supervised playground or hear about a school being renovated, we seldom wonder about who mobilized the community resources to rebuild the school or staff the park. 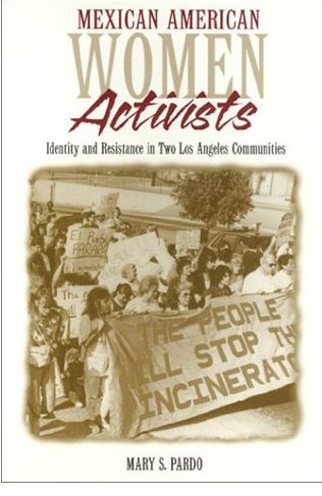 “Mexican American Women Activists” tells the stories of Mexican American women from two Los Angeles neighborhoods and how they transformed the everyday problems they confronted into political concerns. By placing these women’s experiences at the center of her discussion of grassroots political activism, Mary Pardo illuminates the gender, race, and class character of community networking. She shows how citizens help to shape their local environment by creating resources for churches, schools, and community services and generates new questions and answers about collective action and the transformation of social networks into political networks. By focusing on women in two contiguous but very different communities the working-class, inner-city neighborhood of Boyle Heights in Eastside Los Angeles and the racially mixed middle-class suburb of Monterey Park Pardo is able to bring class as well as gender and ethnic concerns to bear on her analysis in ways that shed light on the complexity of mobilizing for urban change. Unlike many studies, the stories told here focus on women’s strengths rather than on their problems. We follow the process by which these women empowered themselves by using their own definitions of social justice and their own convictions about the importance of traditional roles. Rather than becoming political participants in spite of their family responsibilities, women in both neighborhoods seem to have been more powerful because they had responsibilities, social networks, and daily routines separate from the men in their communities. Pardo asserts that the decline of real wages and the growing income gap means that unfortunately most women will no longer be able to focus their energies on unpaid community work. She reflects on the consequences of this change for women’s political involvement, as well as on the politics of writing about women and politics. Author note: Mary Pardo is Professor of Chicana/o Studies at California State University, Northridge. She is the author of several articles on women and grassroots organizing and has been active in the Chicano Movement in Los Angeles for about twenty-five years. Pardo, Mary. Mexican American Women Activists. Temple UP, 1998.